Content marketing is a discipline hamstrung by so-called best practices that discourage and mislead beginners and adepts alike, says this successful content-marketing veteran. Online content marketing has been around for a decade or so. Like anything digital, content marketing has metamorphosed from its origins on message boards to its mature form that includes anything from animated infographics to skydiving stunts. One of the most widely accepted best practices urges marketers to produce more content. The Content Marketing Institute conducted a survey of content marketers that found 70 percent of marketers plan to produce more content in 2015 than they did in 2014. Why? Because they think more is better. According to the Aberdeen Group’s survey, most marketers feel they don’t produce enough content. These content marketers know the statistics. They know that content-marketing leaders get more than seven times the traffic of non-leaders. So, they plan more content. Even high-authority sources like the Harvard Business Review insist we need more content. Marketing leaders like Gary Vaynerchuk call for more and better content, and demand content marketers try to achieve both. But I’m not convinced more content is a pillar of content marketing. Because maybe you produce enough content, or maybe you don’t produce the right kind. Or maybe you don’t produce content in the right place. Or maybe more content will have a regressive effect on your marketing. Scott Monty declared nearly two decades ago, “The last thing the world needs is more content.” Yet Internet content grows at mind-numbing speed. Could we create more valuable content by producing less? That idea goes against everything content marketers have learned, but the principle is backed by good authorities. Some voices of reason explain that more is not better. Summary: More content is not necessarily better. To decide whether you’re producing enough content, you must think hard about your audience. In the minds of many “authorities,” content marketing equals a blog. Have you seen charts like this explaining the centrality of a blog? Blogs are great. I’ve started a lot of blogs. I write blogs almost every day. I’m passionate about blog content marketing. But I know blogging isn’t the only way to do content marketing. It might not even be the best way for your company. The problem with a blog is two-fold. Second, blogs often prevent a business from creating other content that might be more effective. A blog drains energy and resources from other efforts. Could you host a webcast for the time and cost of a few blog posts? What if that webcast brought in 10,000 leads, whereas your blog article brought in a few hundred? A blog often bars entry to content marketing. If you stop thinking you must blog, you may discover a far more successful venue for content marketing. According to the person who coined the phrase “content is king,” software is content. Just about anything digital is content. I’m not saying Gates is right or wrong. My point is, content is broader than you think. Content is more than just a blog. Summary: You don’t have to start a blog to do content marketing. You might not even need a blog. 3. Content marketing is expensive. Another barrier to content marketing is its perceived cost. 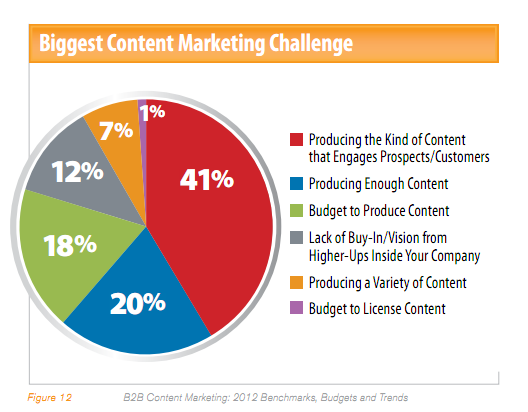 Content Marketing Institute’s 2012 survey discovered that the biggest content-marketing challenge for 18 percent of businesses is a lack of budget. 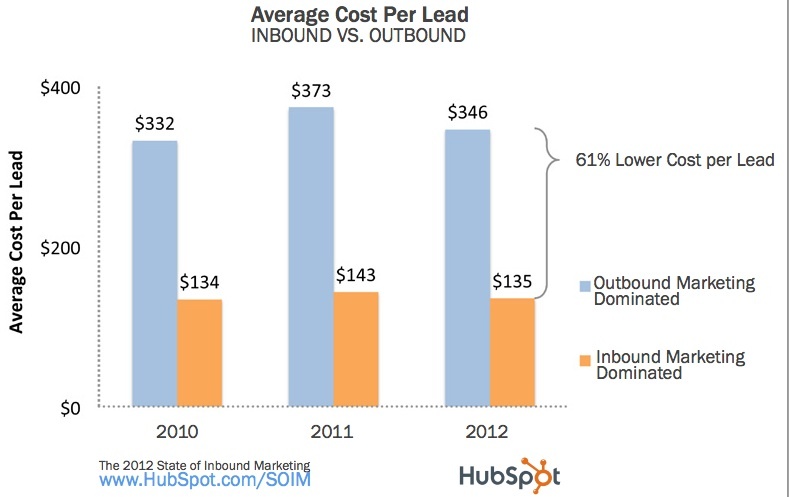 Hubspot discovered the average cost of an inbound lead was $135 (in 2012). While that’s 61 percent lower than an outbound lead cost, it’s high for a startup with slim resources. How much does content marketing cost per month? For a mid-sized business, it could cost as much as $12,000 per month. For a large company, more than $30,000 per month. That’s too expensive for some companies. There are ways to overcome this. Content marketing doesn’t have to be expensive. By producing user-generated content, social buzz and viral campaigns, the cost of content can be extremely low. Its high cost is a myth perpetuated by businesses who feel they have to spend a lot. Should you spend more if you can afford it? If it has a return on investment, of course. Summary: The cost of content can be much lower than you expect. Don’t feel like you have to spend a lot on content marketing. Some content marketers believe shorter is better. Why? According to SerpIQ, the average content length of the top 10 search results exceeded 2,000 words. Top-ranked results aren’t skimping on content. SEO common sense says if you want to rank higher, you should write more. This is true for my niche and my audience. So, I produce really long content. It’s not uncommon for me to write a blog post that is 4,000 words or more. Treating a subject matter in depth requires that length. I’m not going for word count; I’m trying to produce an authoritative piece. 400 words?! That’s a few paragraphs, not a full-blown article! You don’t have to keep it short. But you shouldn’t feel like 2,000 words is the minimum, either. Summary: It’s not about length. It’s about well-written pieces that engage your audience. 5. You have to grab their attention. A killer headline is important. But I contend a headline isn’t the most important thing about an article. Content marketers sing the virtues of short, punchy headlines, detailing how many seconds it takes a user to read a headline and decide if she wants to read the article. It’s easy to get swept up in the excitement. We think we have to grab their attention or it’s a lost cause. But let me give those of you who think yourselves indifferent headline writers some encouragement. Eight out of 10 people will read the headline, but only two out of 10 will read the rest. Of course, a few click-bait headlines will defy my statistic. But by and large, my statistic reflects real user behavior. Only 20 percent read the article. That’s OK, because the 20 percent who read the article are the audience you’re trying to reach. Your audience is not the 80 percent who read only the headline, but the few who read the whole thing. Summary: Make your headlines as good as possible, and then focus on producing a great article. The only best practice you should never ignore: Know your audience! Take every best practice with a grain of salt. Do the one thing that matters: Know your audience. Who are you trying to reach? What is their journey? What are they interested in? What inspires them? What do they want to discover? Your form, method, frequency, length, style, approach, tone, structure, images-whatever! -should depend on what’s best for your audience. What content marketing best practices do you question? A version of this article originally appeared on The Daily Egg.